New Jeep will be revealed in Brazil in 3rd qtr. The SUV is expected to be assembled in several plants globally. The Jeep SUV due to replace the Compass and Patriot will be revealed in the third quarter in Brazil before it debuts in the U.S., Jeep brand head Mike Manley says. Manley told an Australian news outlet that the vehicle would make its world debut in the third quarter in Brazil. It is expected to arrive in the U.S. later in the fall. The compact SUV is expected to be assembled in several plants globally, including Pernambuco, Brazil, for distribution in South and Central America. Separately, Automotive News has learned that the SUV -- which some have dubbed the Compatriot -- will be assembled for North America in Toluca, Mexico, and not at the Compass and Patriot's traditional home in Belvidere, Ill. Supplier and Fiat Chrysler sources say pilot model production will begin next month in Toluca, where the Dodge Journey and Fiat 500 minicar are built. Full production of the vehicle, which carries the internal body designation MP, is scheduled to begin on Feb. 1, 2017, in Toluca. The current Compass and Patriot are scheduled to be produced in Belvidere until Dec. 31, supplier sources said. 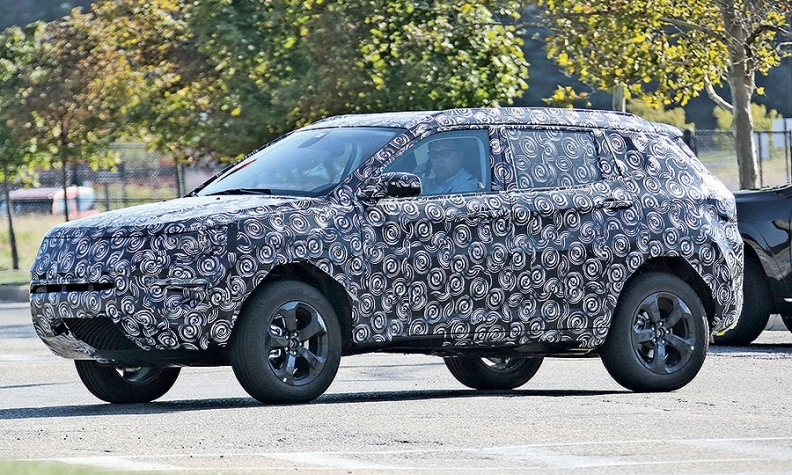 Spy photos indicate the new vehicle will share a platform with the smaller Renegade, but will retain its Grand Cherokee-like exterior styling.